A Van Buren County school is the latest to join a national movement. 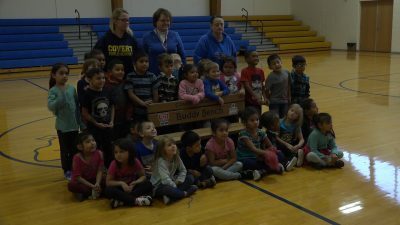 Covert Elementary School was one of two Southwest Michigan elementary schools to receive a Buddy Bench at the beginning of the school year. The bench was officially presented Friday afternoon. Last school year, students wrote letters stating why they felt their school deserved to receive a bench. All of the letters written by Covert’s students were compiled in a binder, and sent in as one entry. The Buddy Bench is meant to be a place for students who feel lonely on the playground to make new friends. It’s part of a nationwide movement that started in 2013 in Pennsylvania.